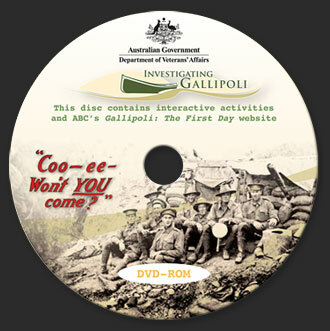 These 10 interactive activities are on the DVD-ROM that is part of the Investigating Gallipoli Resource for Primary Schools from the Department of Veterans’ Affair. Each interactive supports one or more of the learning activities set out in the Teacher’s Guidebook at the appropriate level (primary or secondary). They may also be used as a stand-alone activity to ‘spark’ student interest or an introductory activity for a specific topic. The suggested level is a guide only to the relative complexity of the activity. The primary level activities may be appropriate and useful for many older students, and some older primary students will find the secondary level activities interesting and challenging. have students work in pairs or small groups at the computer and share tasks. Can you help the troops get to the battlefront? Gallipoli: Who, where and why? Can you plan the landing at Anzac? Who were the nurses in the Gallipoli campaign? Students have to help the Anzacs’ troopships get to Egypt. This is a sequential activity that follows the basic path of the convoy of ships carrying the first Anzac troops to Egypt. Students make 10 decisions. Most are about the direction that needs to be taken by the ships, some are about calculating speed from time and distance. If students choose the correct option they can go to the next situation by clicking on Continue. If they choose the incorrect option they receive help in the feedback response. To navigate the ship through the Suez Canal students use the left or right arrow keys, and can increase the ship’s speed by using the up arrow key. This activity can be used before students look at activity 6 and the associated worksheets in the Primary School resource. The interactive will help them understand the concept of the journey at a basic level, and will help them gain a richer understanding of the material provided about the journey. Students learn about the location of the Gallipoli conflict, why forces were fighting there, which nations were involved and who were the main forces, and where they fought. Why were nations fighting at Gallipoli? Students click on key names to reveal a simplified outline of the naval and amphibious plans at Gallipoli. The use of the dynamic map makes the aims and overall strategy of the campaign clear. Students match images of a nurse and soldiers from a number of countries to understand which nations were involved in the Gallipoli campaign. Students see where these allied nations’ forces landed at Gallipoli on 25 April 1915, and understand that the Australians and New Zealanders landed as a combined force, and separate from the other Allies. the Anzacs landed at one particular place. Students may readily identify some of the uniforms of the soldiers and be able to identify their nationalities, but clues are given that will help students avoid guessing rather than working out. The activities provide a simple way for teachers to introduce the information in activity 8 and the associated worksheets in the Primary School resource. Why were nations fighting in 1914? There are three related activities that explain why there was a war, why there was fighting at Gallipoli, and why the Allies launched their landings on 25 April in the way and the places that they did. In the first two activities students identify the sequence of events that led to war, and why the Allies were fighting at Gallipoli. These are map-based and clearly illustrate the situation that existed by 25 April 1915. The third activity is a decision-maker that challenges students to consider what is involved in an amphibious invasion, and what the consequences of different possible decisions might be. Students decide what option they choose for ten situations that the Gallipoli landing decision makers had to face. In each situation students can roll over the three options to see a comment on the probable consequences of each option. Once they have chosen they see what the actual decision made in 1915 was. The interactive has to be done sequentially as earlier situations influence decisions they make in later ones. The final activity asks students to make a simple summary of what happened. These activities provide a simple visual summary of the complex sequence of events that led to the outbreak of war. They also illustrate simply and clearly the plans behind the Allied invasion of Gallipoli. They thus provide a simple but effective way of introducing the ideas that can then be explored in more depth and detail in units 1, 2 and 3 of the Secondary School resource. In this activity students explore some of the important decisions that had to be made for the 25 April landings at Gallipoli. In this way they gain a greater understanding of the concept of decision-making that determined the fate of so many men on the day. When students have made all their decisions they write their own account of the ten aspects of the landings, and show their own understanding of what happened, and why. This decision-maker is an excellent way of stimulating discussion in class of the issues facing the decision-makers at the time. It will help them make a more informed and empathetic judgement of the men who made the plans. This interactive is specifically targeted to help students in Unit 3 of the Secondary School resource. Students will work through a range of mainly primary source documents about the life of one soldier at Gallipoli. Students create a diary from the perspective of that soldier, including information on a series of set aspects of his life. In some cases the evidence may not be clear, or there may be contradictory evidence, so students must decide how to solve these problems. They discover that the soldier dies in 1915, so then add to his diary an account of his death by the nurse who was with him on the hospital ship. A final entry space in the diary is provided for students to document their own reflections on what they have learned from this brief biographical exercise. This activity is most relevant to Story book activity 12. It will be a challenging activity for some primary students, but many will be able to handle it well, particularly if they work in pairs or a small group. Students should be encouraged to look at all the evidence before they then try to cover specific aspects in the diary pages. Teachers can make the activity less time-consuming by allocating specific documents to a student or pair of students, and then they are responsible for suggesting what information their document provides on any of the aspects to be covered. Teachers would do this by allocating the documents, letting students view and think about them, and then working through the aspects: ‘Who has a document that helps us decide what this man’s name is?' and so on. The final activity is a reflective piece. Before setting this piece teachers may refer students to activity 13 and the associated worksheets in the Primary School resource. Some of the documents are reproduced there, and there is a brief summary of Jim Martin’s life that the students can compare with their own version. Jim Martin’s experiences at Gallipoli are also relevant to unit 5 of the Secondary School resource, exploring the daily realities of life at Gallipoli. Students use a range of evidence to discover aspects of nurses’ experiences during the Gallipoli campaign. The evidence focuses on the life of one nurse, Elsie Cook, but also includes information about other nurses who were posted to Cairo, Lemnos, and on hospital ships off Gallipoli. They create a poster that illustrates these experiences. This is a secondary level activity relevant to unit 5 of the Secondary School resource, exploring the daily realities of life at Gallipoli. It is one that many senior primary students will also be able to use. Have students understand the task first, and the two sets of questions (one on Elsie, and one on nurses in general). This will direct their reading of the documents. Students can then read through the collection of documents, and start answering the questions. Alternatively, they can start with a specific question, and use the magnifying glass symbol to call up the evidence relevant to that particular question. Students will discover that Elsie was a rare example of a nurse who was married before she enlisted in the AANS (the rules forbade this), and that she was not promoted as a result. She left the AANS on her return to Australia in 1916 because she knew she would not be sent overseas again. She joined the Red Cross (known as the ‘Bluebirds’ because of the colour of their uniforms), and was sent to the Western Front. Note that Elsie Cook and the other people in this interactive are real people. The information about them is based on historical records. The documents (such as the photo album and the letters and associated photographs from nurses) are not real items, but have been constructed from historical photographs and other documents. This interactive is based on the book by Peter Rees, The Other Anzacs, Nurses at War 1914-1918, Allen & Unwin, Sydney, 2008. Students look at a variety of visual and written information about the soldiers’ daily lives on Gallipoli to create their own four-page ‘newspaper’. There are four master pages. Each is laid out differently. Students can give each page a heading, then scroll through each of the three evidence sets on each page by using the left and right arrow buttons. When they decide that they will include a particular photograph or piece of text they leave it showing, and then write a caption or text for it. In this way they build up their own illustrated description of a particular aspect of the soldiers’ experience. They do this for each of the four pages, so they can have four themes, and 12 documents in their final newspaper. They can then print a copy of their newspaper. This activity is one that allows students to use a series of visual images with little text to create their own newspaper. It is an activity that can best be done when students have completed their study of Investigating Gallipoli so that their own descriptions will be better informed. Some of the documents available on the pages are text-based, but students do not need to include these if they do not want to. Students will normally want to have a different theme or topic heading for each page, but that is not essential. Students explore the main displays in the Australian War Memorial’s Gallipoli gallery. They use a set of criteria to analyse the display, and to decide if the gallery provides a fair and balanced representation of the Anzacs’ Gallipoli campaign. Students can print the criteria and make notes of their responses as they explore the displays, or they can explore the displays, respond to some specific questions about each display, then complete their evaluation at the end. This activity has been designed as a virtual site study for students. It is an activity that can best be done when students have completed their study of Investigating Gallipoli. This will allow them to make better-informed judgements about the Gallipoli gallery as a representation of history. Students should realise that not all objects on display have been included and described here, but the tour provides them with a majority of the main exhibits. Students could also use this activity as a ‘test run’ to develop their skills in analysing a site, and apply the criteria page to a local museum display. Students should also realise that the task of ‘critically analysing a site’ does not imply that every site has to be judged negatively. Rather it means that students are to provide an informed, balanced, thoughtful and fair comment on the strengths and weakness of the display they are analysing. Students explore changes in popular attitudes to the Anzac legend over time. They do this by examining 28 short pieces of evidence of attitudes over nearly 100 years. They decide what the evidence shows about the increasing or decreasing acceptance of the Anzac legend as part of Australia’s national identity. They place this evidence on a timeline, and reach an informed and balanced conclusion. The conclusion reached will be tentative, and based on limited evidence, but it will provide a working hypothesis for students to research in greater depth. This activity is one that might be best done at the end of students’ exploration of Investigating Gallipoli. The role of the Anzac legend as part of Australian national identity has changed over time. Our current period is seeing a high point in the perceived strength and relevance of Anzac as part of national identity, and in particular of young people’s sense of tradition and heritage. At the same time some historians are critical of its strength, and would rather see more emphasis on the development of democratic institutions as the real basis of pride in Australian achievements. This activity is an excellent one in helping students to understand how attitudes to the relevance of Anzac to civic identity have changed over time, and to encourage a critical evaluation of its importance in our history. Students explore a local community. They discover that various buildings contain information about local people and the Gallipoli campaign in 1915. They have to identify what each piece of information is telling us about that local community’s involvement. They then have to decide on a symbol that will get that message across to others. They place their symbols on a community memorial board, and tell that community’s story through this symbolism. This activity asks students to use symbols to create a story. Teachers may need to explain to students what a symbol is: at its simplest, a picture or sign that represents something else, something that communicates a message or meaning. Teachers could refer to commonly used symbols that students will understand as examples, such as symbols for male and female, road signs, or emoticons. In each building students have two choices about what the meaning of the object is, and what it tells us about that community’s contribution to or involvement in the Gallipoli campaign. They also have a choice of three symbols that can be used to represent this idea. In each case two of the symbols are not appropriate. If students choose the incorrect symbol they are prompted to try again, and are not able to continue until the correct one has been selected. The memorial board that students produce will be like a hieroglyphic. Students could be encouraged to explain their board to their parents, and so be involved in ‘translating’ it and communicating their ideas orally. Students explore what epitaphs on grave markers in Anzac cemeteries can tell us about the attitudes and values of families in Australia towards their deceased loved ones. They then create their own analysis of the attitudes and values based on a selection of epitaphs. Students hypothesise about some of the characteristics of the Gallipoli fighting as revealed by an analysis of some biographical details of those who died there. Students are also able to download a database for extended analysis of their own. This interactive could be used either as a starting or an ending activity for a study of Investigating Gallipoli. If used as a starting activity it will help students develop a range of hypotheses or expectations about what the conflict at Gallipoli was like, and how people reacted to it. These can then be tested partly within the interactive itself, and then much more fully as students work through the activities in Investigating Gallipoli Primary School resource. If used as a final or summative activity it will help students reflect on key aspects of the conflict, and in particular on why Gallipoli has continued to be such an important part of Australia’s history and sense of national identity.